iFire - Screensaver-like app for iPad/iPhone. 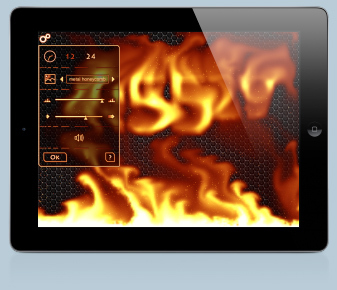 Interactive simulation of burning fire physics. Let's play with Fire! Literally hottest application for your iPhone�, iPad� or iPod Touch�. Incredible realistic burning screen simulation. Interactive via multitouch gestures, accelerometers and gyroscopic sensors. Variable backgrounds, adjustable settings and stylish burning clock. Complex and extremely optimized mathematics solving Navier-Stokes equations in realtime to simulate gas dynamics of burning fire, accompanied with sound effects simulation. 98% of this software (by execution time) was hand-written on perfectly optimized ARM NEON Assembler, utilizing all power of A4 and A5 processors and giving more than 10x times performance boost comparing with C++ code. Hard to believe but true - all that stuff is just for fun!